By the worlds standards, I am not supposed to be successful. I was a teenage mother at the age of 14, my daughter died when she was 4 years old and I was only 19 years old, I was homeless from the ages of 19-21, I was a stripper from the ages of 21-23, I have been married and divorced twice, and I am a single mother. The forces of evil had a different outcome in mind for me. I should be poor, unhappy, washed up and broken down, mentally ill, and possibly addicted to substances. But God…..He had a plan all along. God will take your test and give you a testimony. He will take what was meant for your harm, and use it for your good. Everything that was supposed to have killed me has become a part of my purpose. 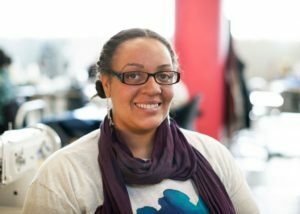 I am now a Social Worker in a homeless shelter, but my job is more than a 9:00 – 5:00, it is my life. My past is the reason that I am not judgmental, it is the reason I am able to connect with different kinds of people, it is the reason I can look a person in the eye and see their pain, it is the reason why I know that God can change anybody because He changed me, and it is why I am both sympathetic and empathetic. I am not a vengeful person. However, when I was younger I faced a lot of judgment because of the things going on in my life. Judgment from my family, the church, even the world at large. I knew what people thought looking at me and my life at the time. Failure. So, I made it my point to prove the world wrong. I was going to make it, I didn’t know how exactly, but I knew I was going to make it. I used the judgment, the looks, and the comments as fuel for my fire. I made their judgment my motivation for success. Every goal I accomplished I did it with tears in my eyes, and almost a rage sometimes. My astrological sign is a Taurus, which is symbolized by the bull. My sheer stubbornness won’t allow me to fail. Be a failure, Ha! I won’t allow it, just to prove you wrong! I knew an education was important to success in this world, particularly for a minority. So, I made it my mission to become educated, even if it killed me. It took me eleven years, but by God I finally earned that Bachelor’s degree. Then years later, after starting my career in Human Services I lost the biggest job I had up to that point, and was going through a divorce, but I still earned my Master’s degree. Unfortunately, even getting married was a part of me trying to prove everybody wrong, I did it for the wrong reasons, and that is one of the reasons it didn’t last. I have a wonderful and fulfilling career. It is my passion and the culmination of everything that I have been through. I get to walk into work each and every day and give love, understanding, and support to some of the most vulnerable people in our society. The shelter I work at houses homeless women and children. The people that the world looks down on, just like it once looked down on me. I am there to help them change the circumstances of their life, to support them, and many times I am there simply to comfort them. The women are in constant crisis and we are there to help them get through it. I also have a beautiful daughter who I love with all of my heart. This is a part of my success. Being a single mother is not easy, but I make it work. I didn’t have a good relationship with my mother, and I refuse to let that be the outcome of the relationship with my daughter. My daughter is a beautiful person and a gift to the world, and that is successful. Let me ask you a question? What is your story? What are the challenges you are facing? Has your family, the church, your boss, teachers, even the entire system spoken your destiny to be a failure? Are you in the midst of the fire now? Determine in your heart today that YOU WILL BE SUCCESSFUL. Take the very thing that people think will be your failure and turn it into your testimony. Instead of being angry and bitter, let it be your motivation. Learn to use your anger in a positive way. Don’t continue to sink down lower, flip it around and use your deficiencies as an advantage. This list of blog titles itself is full of motivational points to help you reach success. You can go back and read each one as time permits. People ask me all of the time am I helping anyone, do I have any success stories so far. The answer is a resounding yes, and you can see my posting titled “Serendipity” to hear a motivational story about one of my ladies named Ethel Rucker. She is doing so well I can hardly keep up with her success! Her story is still unfolding and she has had even more success since the writing of that blog in July. Looks like I may have to do an update of her soon! Let your success be your revenge. Get them back by doing well for yourself. Don’t argue, don’t fight. Don’t continue to draw the negative into your life. Study, work hard, focus, and accomplish your goals. Before you know it, you will do better than the very people who doubted you. They may just end up having to come to you for help one day. 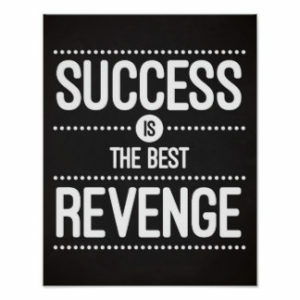 Success is the best revenge! You can do it, I believe in you and I love you. Until next week….. I never knew your story but I am glad I met you. Like I always have told you, you are a Remarkable lady and you define your own success Not society. There are so many women that have a similar if not worse story. By telling your story hopefully you have inspired other women and young girls to still pursue their dreams. Don’t let your past determine your future. Keta, thank you for your comment. I hope too that my story will help other women who are pursuing their dreams. I appreciate your support and taking the time out. Yes, Black Girls Do Rock!! !